Happy Friday everyone!!! Birthday 4.0/finale is this weekend so I'm gearing up for great fun with great friends. Today I have 2 older polishes in my stash that I recently combined, annnnnnnnd lets just say I've worn this combination twice since then. It's a quick go to that delivers a wow effect when combined. A while back Kleancolor came out with a chunky holo collection and today I have Chunky Holo Poppy to show you. 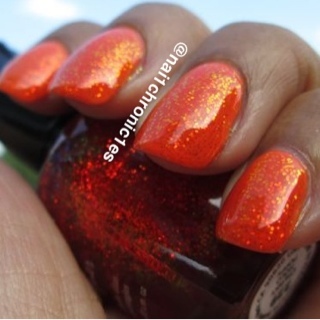 Chunky Holo Poppy is a multichrome glitter in a tinted red base. It flashes yellow and orange and is simply eye catching. The only downside to these polishes is that they smell awful. 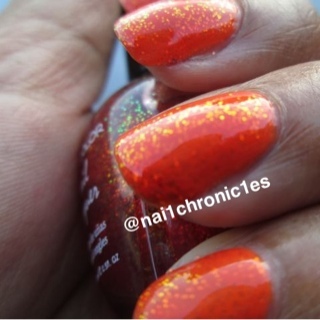 This is one coat over it's layered polish (see below) Check it out. 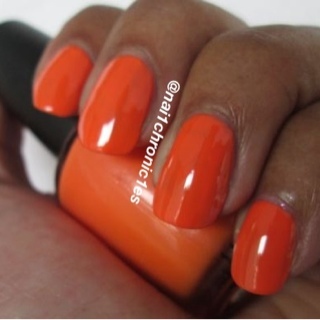 I layered Poppy over Opi's In My Back Pocket which is a vibrant orange creme from the Summer 2009 OPI Bright Pair Collection. Smooth application as well and shown here with 2 coats. Like I said, quick but eye catching. I literally applied this, with a top coat of Seche Vite, 30 mins before leaving out the door. 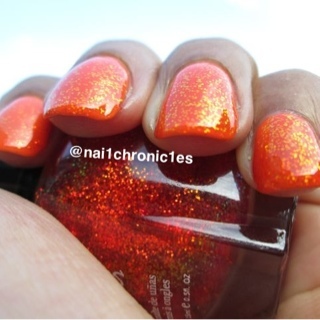 You can still find these chunky holos online including sites such as Ebay. Hope everyone has a great weekend. I love this!!! Such a great combo! Hope you have a great time this weekend ;0).